Trains with magnetic levitation technique made in Japan managed to break the world speed record, in a trial near Mount Fuji to reach speeds of 600 kilometers per hour. 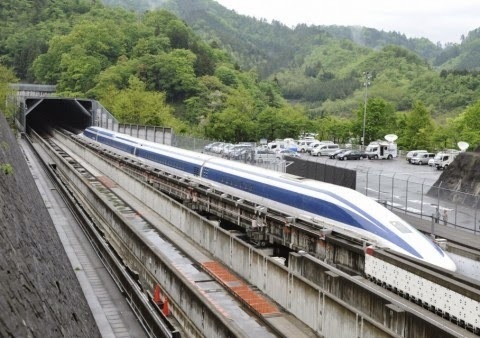 The train carrying seven cars that could even reach speeds of 603 kilometers per hour and successfully drove 600 kilometers per hour for 11 seconds. Thus operator of Central Japan Railway (JR Central) explained on Tuesday, April 21, 2015. The speed record comes less than a week after the operator the same rail speed record of 590 kilmeter per hour, breaking the record held since 2003, reaching 581 kilometers per hour. Magnetic levitation tech lifted the train 10 centimeters off the rails and then move the magnetic force generated electricity. A total of 200 people gathered to witness the record-breaking speed. They cheered when the car reaches a speed of 600 kilometers per hour. "It is very exciting. I want to get on the train. I like to see a new page of history," said an old woman to NHK as the train sped past her. An AFP reporter who had boarded the superfast train, said he felt like he was riding an airplane. "The faster the car is going, the more stable the car. I think the quality of the train is increasing," said Endo Yasukazu. JR Central expects the railway is already fully operational in 2027 and serves Tokyo to Nagoya route as far as 286 kilometers.